Zidane and the Tantalus Theater Troupe have kidnapped Princess Garnet, the heir of Alexandria. To their surprise, however, the princess herself yearned to escape the castle. Through a series of unusual circumstances, she and her personal guard, Steiner, fall in with Zidane and set out on an incredible journey. Meeting unforgettable characters like Vivi and Quina along the way, they learn about themselves, the secrets of the Crystal, and a malevolent force that threatens to destroy their world. I loved this game nearly 16 years ago as a joyous farewell to a series I felt was drifting away from me. 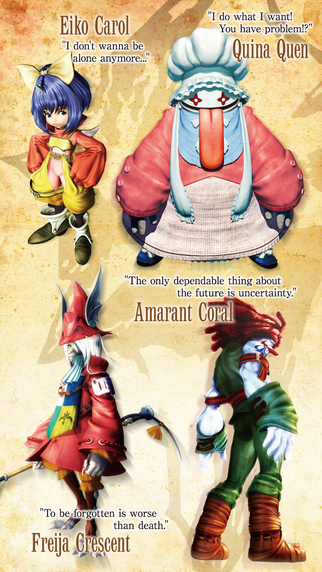 Even though I ended up adjusting just fine to Final Fantasy's new direction from that point on, I still love Final Fantasy 9 today. Not as a farewell to the traditional, but as a wonderful celebration of it. 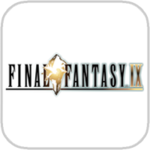 So, should you play Final Fantasy IX on your iPad? Well, that entirely depends. If you have a real hankering to play it again, you may just be able to forgive the awful visuals and imperfect control scheme. Everyone else should probably stay clear though, and just play the original PlayStation version instead. Ironically, the lower resolution visuals will actually appeal more than this because they won't be quite so inconsistent. 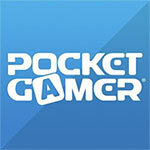 If you’re a fan of the game, a fan of the series who’s been wanting to try this particular entry, or an RPG fan in general, definitely consider giving it a try. A solid port of one of the best games ever made. It's expensive, but you'll get an awful lot of bang for your buck. 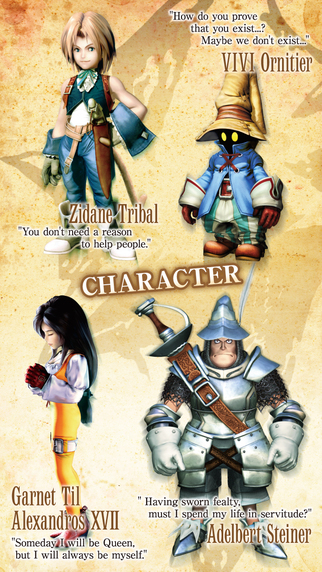 Muy pocos juegos del género de rol japonés, pueden igualarse en calidad y trascendencia a Final Fantasy IX. De hecho, si nos apuráis, muy pocos títulos en general en el mundo de los videojuegos gozan de su importancia en términos absolutos. Graphiquement tout d’abord, le jeu a subit un léger lifting au niveau des personnages. Les modèles des personnages s’avèrent très fin, détaillés, ce qui permet d’apprécier à sa juste valeur le chara design. Petit bémol cependant, cette refonte ne s’étend pas aux arrière-plans, qui sont aussi compressés que leur homologue de l’époque, ce qui donne au final un rendu mitigé. 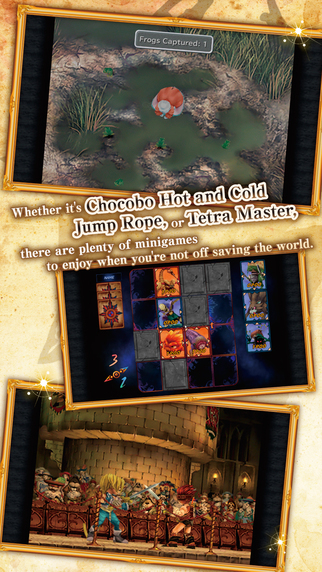 Apakah Final Fantasy IX versi mobile adalah sebuah game yang pantas dibeli? Tentu saja! 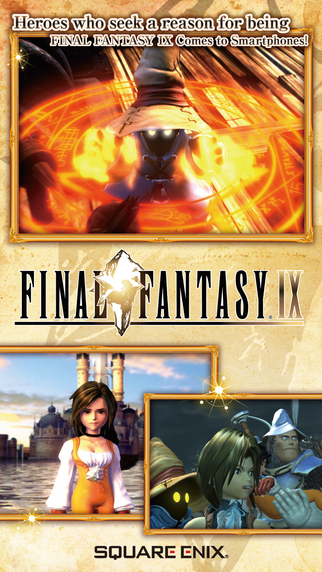 Jika kamu mengaku penggemar game ini atau penggemar JRPG secara umum, memainkan port berkualitas sambil mendukung Final Fantasy IX adalah hal yang wajib dilakukan. 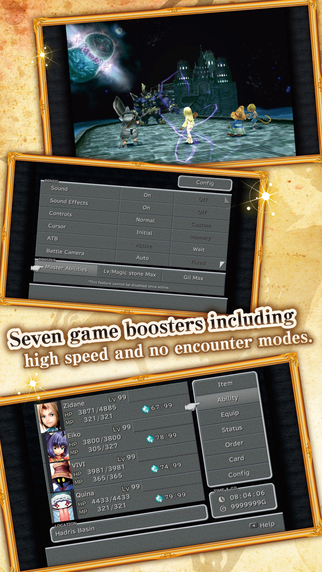 Berbagai hal yang tersedia di port ini juga membuat Final Fantasy IX mobile menjadi game yang cocok dimainkan pemain lama ataupun pemain baru. Spelkontrollen är bra anpassad till det mobila formatet. Du kan använda både en virtuell spelkontroll eller peka direkt i menyerna eller var du vill att huvudpersonerna ska gå. Minus en del tekniska tillkortakommanden är det en klart bättre portning än Final Fantasy VII-diton och har du inte spelat en av Final Fantasy-seriens bästa installationer ännu finns det inga ursäkter till att inte skaffa det.